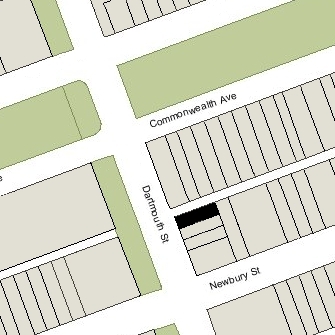 283 Dartmouth is located on the east side of Dartmouth, between Commonwealth and Newbury, with 152 Commonwealth (287 Dartmouth) to the north, across Alley 435, and 281 Dartmouth to the south. 283 Dartmouth was built ca. 1871 by builder James M. Standish, one of three contiguous houses (279-281-283 Dartmouth). He and his wife, Sarah (Grant) Standish, kept 283 Dartmouth as their home and sold the other two houses.They previously had lived at 135 Boylston. James Standish purchased the land for 279-281-283 Dartmouth on November 15, 1870, from Charles Austin Wood, an insurance agent and real estate investor, and the original owner of the Hotel Vendôme. It was the northern portion of a parcel Charles Wood had purchased from the Commonwealth of Massachusetts on the same day. As part of the deed to James Standish, Charles Wood included building restrictions (that would expire after five years) specifying that the front walls of the houses at 277-279-281-283 Dartmouth were to be set back four feet from the property line on Dartmouth and that no house would be built at 277 Dartmouth that extended more than 55 feet east from the property line on Dartmouth. When James Standish sold the completed houses, he included in the deeds a 3 foot wide easement at the rear of the lots at 279-281-283 Dartmouth, allowing passage and drainage to the alley. Click here for an index to the deeds for 283 Dartmouth. James and Sarah Standish continued to live at 283 Dartmouth during the 1876-1877 winter season, but moved thereafter to Gardner Street in Allston. 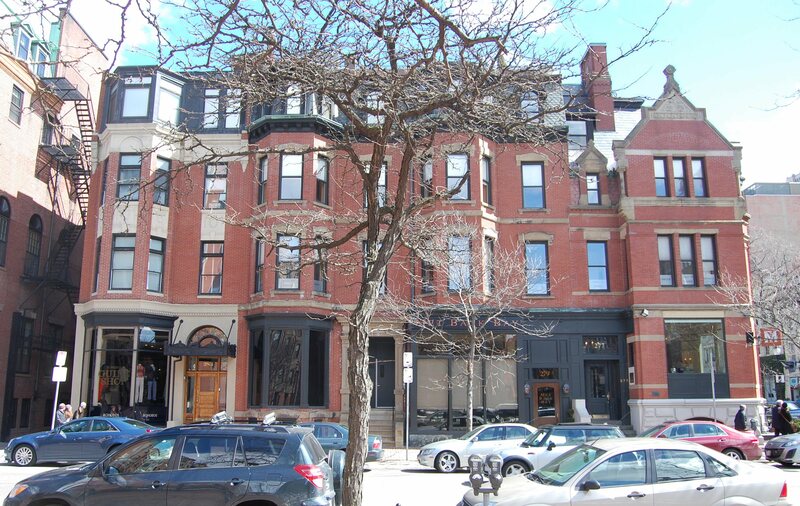 By 1878, they had moved back to 135 Boylston, where Sarah Standish died in July of 1878. He continued to own 283 Dartmouth and lease it to others. By the 1877-1878 winter season, 283 Dartmouth was the home of Mary Abby (Mayer) Greene, the widow of Dr. John Singleton Copley Greene, a physician. She continued to live there during the 1879-1880 season, but moved thereafter to 354 Marlborough. On June 1, 1881, 283 Dartmouth was purchased from James Standish by Dr. Eugene Hanes Smith and his father-in-law, Dr. Samuel J. Shaw. 283 Dartmouth became the home of Eugene Smith and Carrie Maria (Shaw) Smith, and also of Samuel Shaw and his wife, Frances B. (Hunter) Shaw. Eugene Smith was a dentist and, from 1895 to 1924, served as Dean of the Harvard Dental School. Samuel Shaw also was a dentist and previously had practiced in Marlborough. Both maintained their offices at 283 Dartmouth and also rented office space to other dentists. On March 7, 1889, Samuel Shaw transferred his interest in 283 Dartmouth to Eugene Smith. Frances Shaw died in March of 1901. Samuel Shaw continued to live with the Smiths until he remarried, in January of 1903, to Melinda A. Westcott, a teacher in Marlborough. They moved to Marlborough, where he died in July of 1911. Eugene and Carrie Smith continued to live at 283 Dartmouth until about 1920. By the 1921-1922 winter season, they had moved to The Puritan at 390 Commonwealth. He continued to maintain his offices at 283 Dartmouth until his death in May of 1925. On September 30, 1925, 283 Dartmouth was acquired from Eugene Smith’s estate by real estate dealer Ray C. Johnson, and on December 5, 1925, it was was acquired from him by real estate dealer William H. Agry as trustee of a real estate investment trust he formed in 1912 with Edward N. Chase and Ralph E. Johnson. 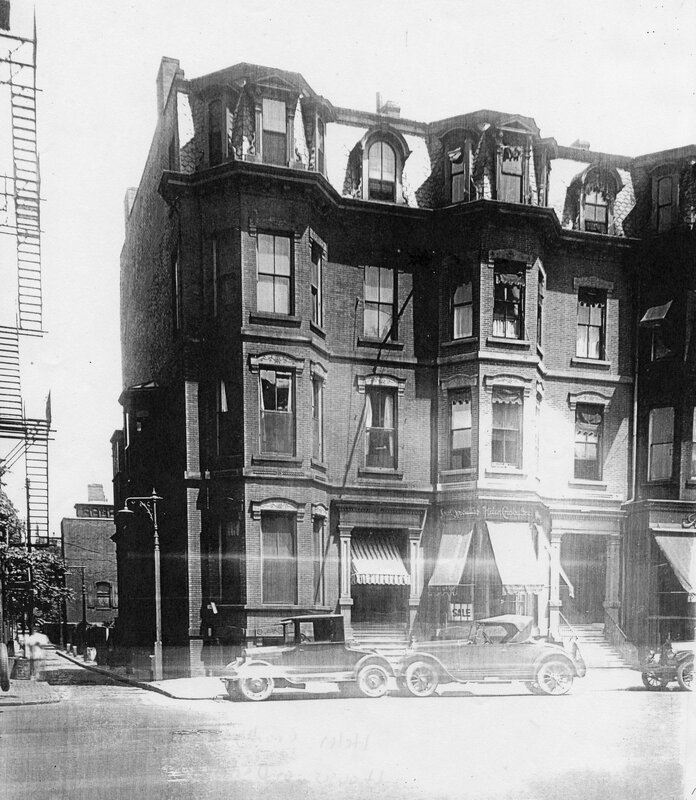 In March of 1926, real estate and insurance broker Herbert Freeman Winslow (presumably on behalf of William Agry), filed for (and subsequently received) permission to convert the property from offices into a store on the first floor, offices on the upper floors, and a residential unit on the top floor. As part of the remodeling, the front façade was redesigned, new oriel windows were added on the alley side, and an “extension” was added at the rear at the basement and first story levels to expand the store area. 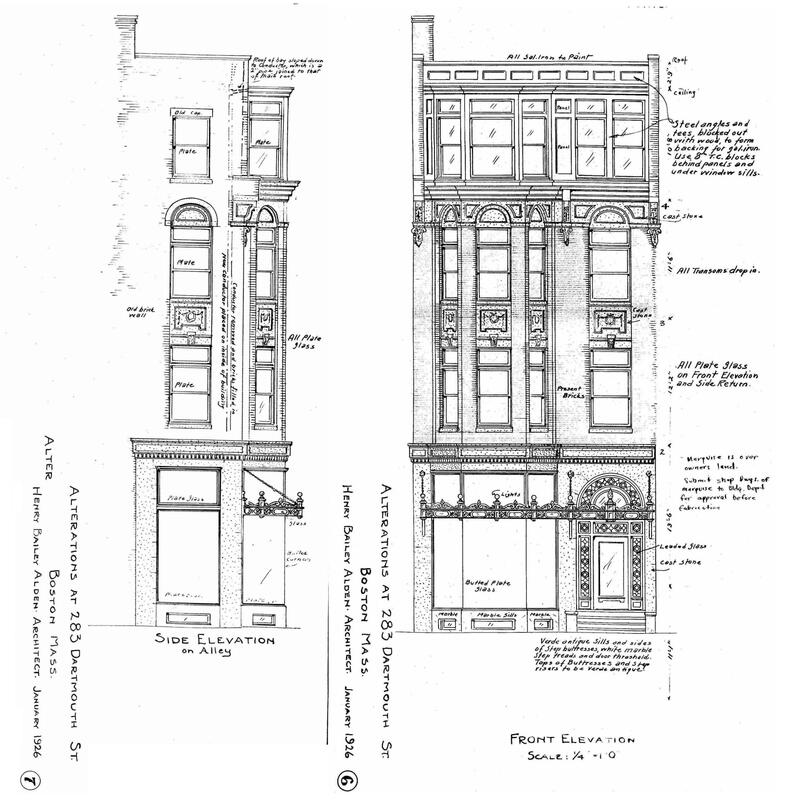 Plans for the remodeling, designed by architect Henry Bailey Alden, are included in the City of Boston Blueprints Collection in the Boston Public Library’s Arts Department (reference BIN P-6). On December 31, 1926, 283 Dartmouth was acquired by Norman Butler Smith (two-thirds interest), his sister-in-law, Madeleine (Fellows) Smith, the widow of Archibald Lavender Smith (one-sixth interest), and the two of them as guardians for Archibald and Madeleine Smith’s son, John Butler Smith (one-sixth interest). On December 27, 1928, Madeleine Smith transferred her one-sixth interest to herself and Norman Butler as guardians of John Butler Smith. 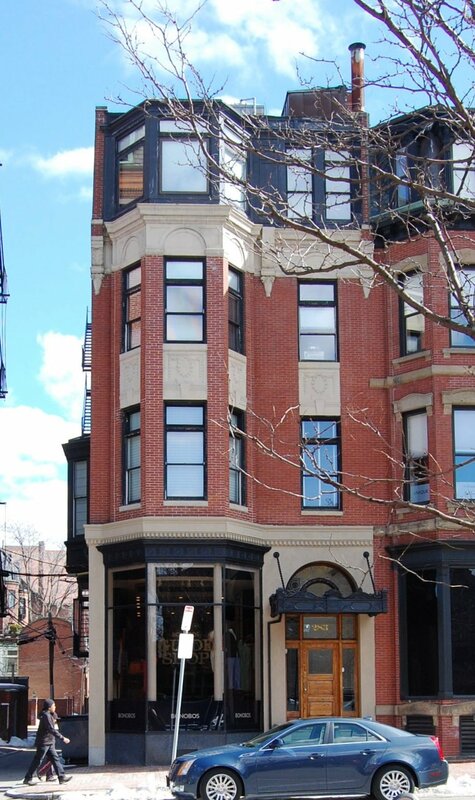 Norman Smith was a real estate dealer and moved his office to 283 Dartmouth after acquiring the building. He and his wife, Dorothy H. (Warren) Smith, lived in Brookline. Madeleine Smith and her son lived in Manchester, New Hampshire. 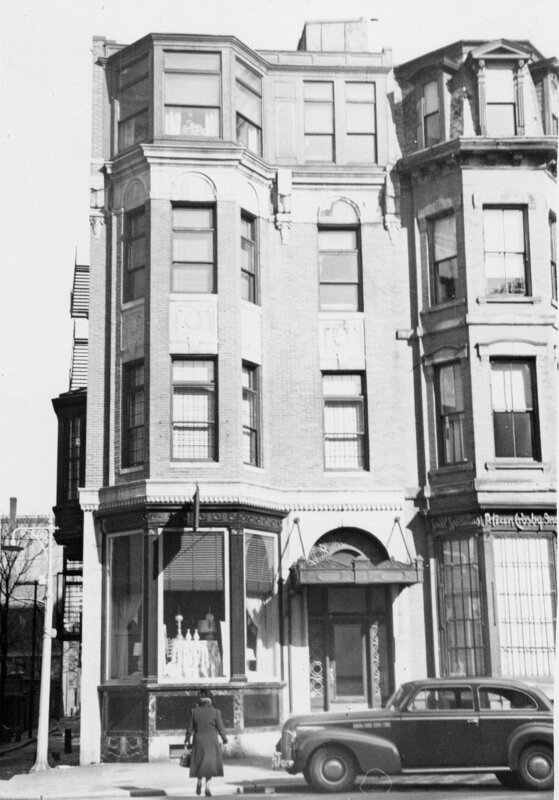 In April of 1929, the storefront was leased by the Atlantic National Bank of Boston. The bank remained there in 1932, but had closed by 1933 and the storefront was vacant. 282 Dartmouth continued to be a mixed residential and commercial building. The residents who lived at 283 Dartmouth for the longest time were Michael Coleman Flaherty and his wife, Loretta (Baker) Flaherty, who lived in one of the apartments from about 1939. They previously had lived at 541 Commonwealth. He was a painter in the 1930s and by the 1940s had become an organizer for the United Shoe Workers of America. She was a social worker. They continued to live at 283 Dartmouth until the late 1960s. On August 26, 1944, John Butler Smith transferred his one-third interest in 283 Dartmouth to Norman B. Smith. On December 28, 1945, 283 Dartmouth was purchased from Norman B. Smith by Miss Elizabeth Childs Murphy, who made one of the apartments her home. She previously had lived at 1730 Commonwealth Avenue. She continued to live at 283 Dartmouth until her death in June of 1967. From the early 1950s, the commercial space at 283 Dartmouth was occupied by d’Ehrmanns Antiques, owned by Tibor d’Ehrmanns. He lived at 112 Newbury. d’Ehrmanns Antiques continued to be located at 283 Dartmouth until the mid-1960s. On February 13, 1969, 283 Dartmouth was purchased from Elizabeth Murphy’s estate by Imre Halasz and Anthony Halasz, partners in an architectural and engineering firm located at 123 Newbury. In March of 1977, they filed for (and subsequently received) permission to convert the property to a storefront with offices and a private health club on the third and fourth floors, eliminating the former residential units. 283 Dartmouth subsequently changed hands. It remained a retail and office building in 2017.